According to Federal health regulators, at least nine people have died from a rare form of cancer that may be linked to certain breast implants, known as anaplastic large cell lymphoma (ALCL). According to the New York Times, the deaths were not caused by breast cancer, but by a rare malignancy in the immune system, anaplastic large-cell lymphoma. This rare form of cancer from implants grows in the breast, usually in the capsule of scar tissue that forms around an implant. The FDA warns that it has received at least 359 medical device reports involving breast implant-associated anaplastic large cell lymphoma (BIA-ALCL), which is a form of non-Hodgkin’s lymphoma. The FDA includes information on at least nine deaths linked to the rare form of lymphoma cancer. The FDA and the World Health Organization (WHO), has determined that breast implants are associated with the rare form of T-cell lymphoma. The FDA first issued a breast implant ALCL safety notice in January 2011, noting that the agency was aware of at least 60 cases worldwide at the time, and that the lymphoma cancer was linked to both saline and silicone breast implants. The FDA received information on the breast implant surface in 231 of the reports, and 203 of those involved the use of implants with textured surfaces, while only 28 of those cases were linked to implants with smooth surfaces. The contents of the implants appeared much less important, of 312 cases where the contents were known, 186 were filled with silicone gel, and 126 with saline. Breast implant lymphoma cases are diagnosed when symptoms develop, like lumps, pain, fluid buildup and swelling. 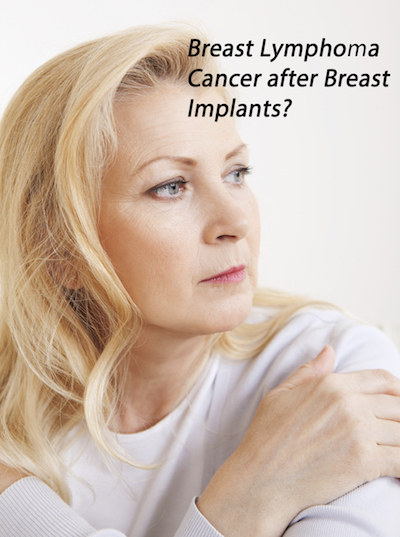 According to the American Society of Plastic Surgeons, some 290,000 women in the United States had implants for breast enlargement in 2016, and 109,000 received them for reconstruction after breast cancer. Usually when the lymphoma occurs, just removing the implant and the tissue around it eliminates the disease. But some women may need chemotherapy and radiation. The FDA is recommending that doctors be aware that cases of the lymphoma cancer have been linked to textured breast implants, and that they should discuss the benefits and side effects of the implants with their patients. The FDA also recommends that doctors consider the risk that a breast implant patient is suffering from anaplastic large cell lymphoma when they present with late onset persistent fluid or mass(es) around the implant. Patients are strongly recommended to know of the lymphoma cancer risk, talk to their doctors about the risks and benefits of textured versus smooth breast implants and to continue with routine medical care and follow-ups. The FDA is calling on both doctors and patients to report any cases of ALCL in women with breast implants to its MedWatchadverse event reporting program. If you or a loved one has been diagnosed or have had treatment or surgery for anaplastic large cell lymphoma after breast implants please contact our office at 888-210-9693 or fill out the contact us form for further information. The Dr Shezad Malik Law Firm based in Fort Worth, Dallas Texas is investigating and accepting breast anaplastic large cell lymphoma from breast implants nationwide.